At one point, the United States, a beacon of democracy and freedom, turned to a despotic, autocratic tyrant for friendship and alliance during a volatile period. As soon as the situation was resolved, however, that very same despotic regime caused mixed feelings among Americans, often leading to violent confrontation. By the way, I’m not talking about Egypt. It was 1778, and a young United States turned to France, an absolute monarchy almost completely anathema to the ideals of the young nation, as an ally in its war for independence against the British Empire. When that very same regime became engulfed in revolution a decade later, the new regime divided Americans as never before—and confused US foreign policy into a “quasi-war” with France from 1798-1800. The recent turmoil in Egypt has us looking at the often strange decisions made in the name of national interest. In looking at the protests aimed to oust Hosni Mubarak, many classrooms will be full of questions about the situation. They range from the mundane (“Where is Egypt?”) to the profound (“How can we resolve the situation?”) and even the profoundly dumb (“Who cares about Egypt?”). It’s time to teach your kids the painful truth about American diplomacy—it makes for strange bedfellows who tend to stay too long in the sack. 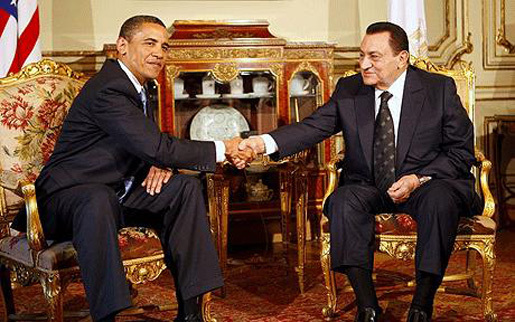 It doesn’t stop at Mubarak and the corpulent king of France. Josef Stalin, Chiang Kai-shek, Mao Zedong (once he was dying), the folks in China after Mao kicked the bucket, Ferdinand Marcos, Suharto, the entire Thai government, Ngo Dinh Diem, Syngman Rhee, the assholes after Syngman Rhee, Islam Karimov, Gurbanguly Berdymukhamedov, Muhammad Reza Shah Pahlavi, Saddam Hussein (before he got greedy),The Saudi Monarchy, The monarchies of the rest of the Gulf states, Mobutu Sese Seko, Teodoro Obiang Nguema Mbasogo, the white regimes in both Rhodesia and South Africa, Rafael Trujillo, Fulgencio Batista, Anastasio Somoza (plus the other Somozas), Manuel Noriega (before he got greedy), Marcos Perez Jimenez, Augusto Pinochet, Hugo Banzer, Alfredo Stroessner and the host of lovable scamps involved in military governments in Brazil and Argentina. All of these people rotting in hell (we hope). All of these people received, at one point or another, the blessing, cooperation, and (the important part) funding from the most powerful democracy on Earth. Well, not only do we do “that sort of thing,” but we’re real good at it—since we’ve been doing it since our founding. Foreign relations, one learns quickly, has very little to do with lofty philosophical ideals or moral imperatives. To be sure, the base of diplomacy lies more in the market bazaar than the debating hall: economics and mutual security drive national ties far more than shared ideology. Today’s diplomatic landscape certainly owes much to our wallets. In the United States, most people worry about gas and consumer prices. Thus, we make nice with two nasty regimes that take care of our needs. The Saudis and their autocratic buddies in the Gulf take care to juice up our SUVs and assorted land monsters. The Chinese and their sundry client states around the South China Sea make sure your little brats get everything they want for Christmas—as well as stock your shelves at Wal-Mart and Target. During the Cold War, the United States’ biggest diplomatic priorities were thwarting Communism and spreading American ideals—in that order. To wit, many of the people we cozied up to from the 1940s to the 1990s shared only an intense anti-Communist streak. Being that “the enemy of my enemy is my friend,” the US looked the other way as dissidents were slaughtered in soccer stadiums, tortured with electrodes, and subjected to inhuman conditions while everything, at least on the surface, looked rosy. As far as Egypt goes, the mutual enemy isn’t Communism but rather Islamic fundamentalism. The Muslim Brotherhood, an illegal Islamist group that allegedly masterminded the assassination of President Anwar Sadat in 1981 (leading to Mubarak’s accession), is the great bogeyman of the Egyptian government. Mubarak fears that his departure would cede Egypt to the Brotherhood, thus plunging the ancient country into the darkness of an Islamic state. I’m not completely convinced this is the case, considering the impact of the military on the country, but it’s been reason enough for the United States to stand by Mubarak for three decades. The United States is not alone in allying itself with distasteful regimes. Other countries, notably in Europe, have done the same thing. To an extent, these connections provide the United States with many of the products, materials and resources we need at the prices we want. The average American has, on the whole, benefitted at least economically from these questionable partnerships. Yet as you think about the people risking their lives in Cairo, Alexandria and all over Egypt, one can’t help wondering: is it worth it? There’s no easy answer to that. We cannot judge all foreign policy as a whole: relations with each country have their own characteristics. Yet the better students can see how all aspects of national identity—economic, military, financial and ethical—affect international relations, all the better for the American diplomats of the future. An article from Salon.com featuring three authoritarian regimes that are friendly with the US. A Report about US policy towards dictatorships from the Cato Institute made during the height of the Cold War in the 1980s. A 2002 Global Issues article about support for dicatorships and terrorism. YouTube compilations of news coverage of the Egyptian protests.